The U.S. Government has now made permanent the ability for those over age 70 1/2 to contribute up to $100,000 per year from their Individual Retirement Account (IRA) directly to qualifying charities without having first to declare the donation as income. This means your income will not increase, permitting you to remain in a lower tax bracket for income taxes and possible Medicare premium surcharges. Depending on your personal tax situation, donating directly from your IRA to ARRL could have more tax advantages for you than a direct personal donation. Here's how it works - Contact the custodian of your IRA plan, such as the bank, brokerage, mutual fund company, or insurance carrier that holds and manages your IRA, and instruct the custodian to make a donation from your IRA directly to ARRL. It is important that the check from the custodian is made payable to ARRL; your custodian will then send you a 1099 form showing you as the owner of the IRA did not receive the income for your personal use. Most custodians will have you complete a direct donation form, and will mail the check directly to ARRL. ARRL is grateful for any size contribution from your IRA, whether it be less than, equal to, or greater than your Required Minimum Contribution (RMD). Please call the ARRL Development Office at 860-594-0348 for additional information. We are happy to help you with any information and mailing instructions that your IRA custodian requires. 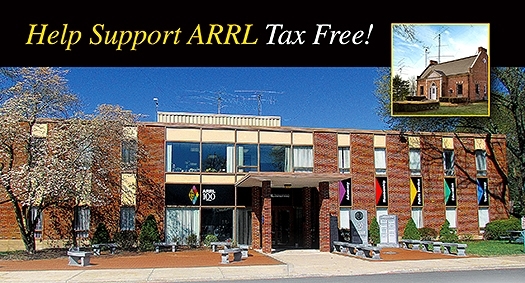 ARRL strongly encourages individuals interested in supporting ARRL through an IRA distribution to consult with their attorney, tax/financial advisor, or accountant to determine the impact of such a gift. The American Radio Relay League, Inc. is an IRS-designated 501(c)(3) organization holding federal tax identification #06-6000004. Thank you for your consideration and support of ARRL!